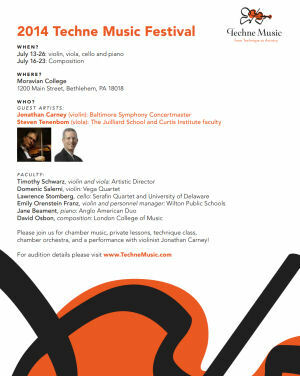 Techne Music is dedicated to the highest level of chamber music, both in performances and education. Our faculty and guest artists have included faculty from The Juilliard School and the Curtis Institute of Music, concertmasters of the Philadelphia Orchestra and Baltimore Symphony, and members of the Orion, Vega and Serafin String Quartets. Our small but select student body are carefully chosen for this unique and challenging type of musicianship. Techne Music is proud to announce it is currently a non-profit organization! Techne Music would not be possible without the generous donations from our patrons. Donations have gone towards scholarships, guest artists, food for students, and faculty. Tuition only covers 25% of the total cost for the festival, so without the generous support from donors, Techne Music would not be possible. Copyright © 2019, Techne Music. All rights reserved. | Website designed & maintained at 15 West Bellamy.